Google announced late last week that they are making three changes to how mobile ads work in their network, in order to help with accidental ad clicks. (1) Blocking clicks that happen close to the image edge: On mobile image ads, Google has identified the image border as an area prone to accidental clicks when users are trying to click or scroll to adjacent content. Now, they must click on a more central part of the image to navigate to an advertiser’s website or app. (2) Blocking clicks on the app icon: On in-app interstitial ads, users will no longer be able to click on the app icon of an install ad given its proximity to the ad close button. Instead, users must click on the call-to-action button to visit an app store page and install the app. (#) Adding a clickability delay: Ads will only become clickable after they’ve been onscreen for a short period of time. This gives users enough time to examine the content of an ad and helps eliminate accidental clicks from users who didn’t expect to see an ad. 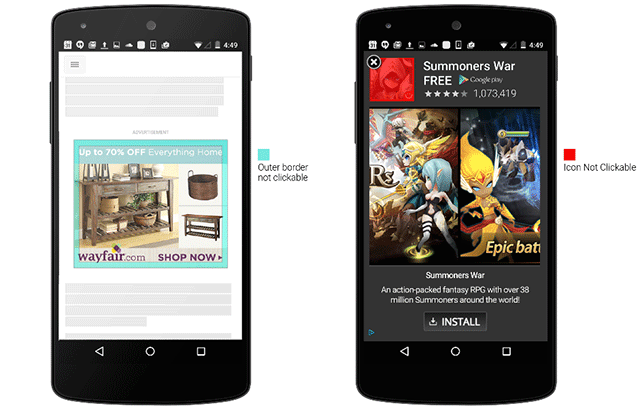 Google hopes this makes for less accidental clicks on mobile devices. Previous story: Google's Spammy Structured Markup Manual Action Lead To Ranking Decline?